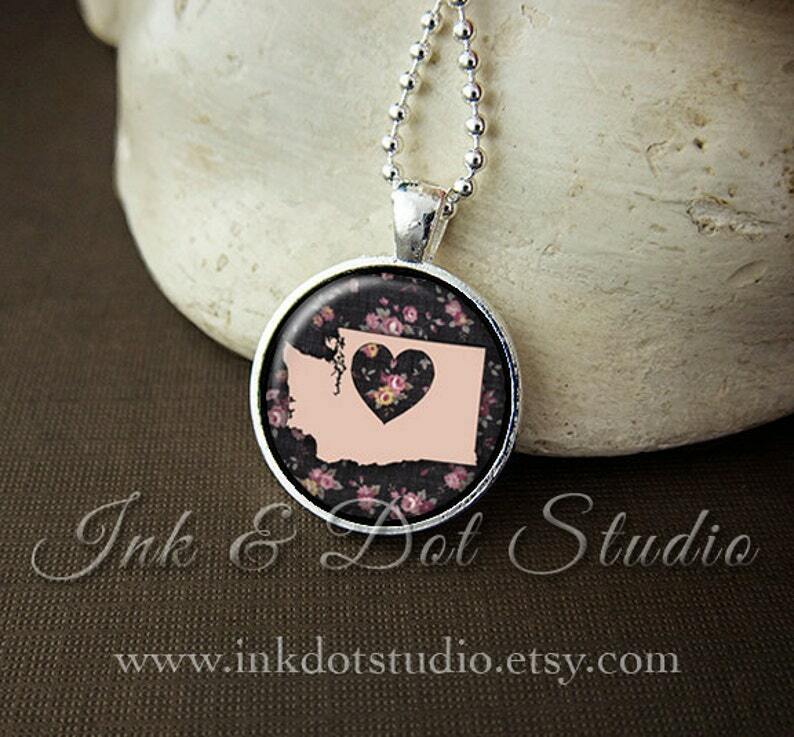 Show off your state pride with this floral Washington state 1" glass pendant necklace! This design is an original by Ink & Dot Studio. My pendant images are printed and sealed under a glass dome cabochon. The circular cabochon measures 1" (25mm) in diameter and is set in a shiny silver plated tray. Listing is for the pendant, but I also offer to include a ball chain or key ring at no extra charge. Genuine black leather necklace upgrades are also available. Leather cord measures 3mm in diameter and has a lobster clasp enclosure. Pendants and keychains are made to order so please be aware of the current processing time in my shop announcement. I do try to fulfill orders before that time. You will receive your unique Ink & Dot Studio in Ink & Dot Studio packaging. I will ship your pendant protected in a bubble envelope and ship via USPS First Class from NY. • LOOKING FOR A DIFFERENT STATE? Pendants are water-resistant but not waterproof so please protect your pendant from water. The majority of the designs in my shop are my own creations and are customizable. If you see something you may want to rearrange or add to a design, send me a message and I'll see what I can do! I can do custom orders! Send me a message and we can get that started! Copyright ©2010-2019 Ink & Dot Studio | All rights reserved. This was the perfect gift for a special familiar member. She is thrilled with it ! I will definitely order again and again! Absolutely love them. I bought 5 for St. Pats Day gifts.